And there is the cute factor. Cloth diapers are SO damn cute! I got the diapers and excitedly washed them and went into it full time. There was a learning curve: What detergent to use? How much? How long can he wear one? 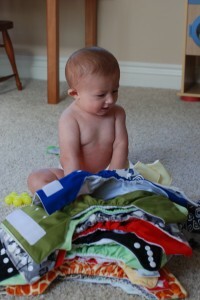 How often do I need to do diaper laundry? How will we handle being out and about? Can I handle the poop? What about the extra laundry? I won’t lie. We had some leaks (pee only) as I figured out how to really use the diapers correctly and get the best fit. But soon it was like second nature. And it was true: diaper laundry really isn’t like regular laundry! My daughter who was two at the time and not yet potty trained, was NOT interested in wearing cloth, so we continued to use our disposables on her until she was. We figured that it wouldn’t be long. Of course, kids always keep you on your toes and she didn’t end up potty training until right before her third birthday. Which meant we always had disposables in the house. In fact, my daughter and my son were wearing the same size disposable diapers. So I would find myself using them on Ev occasionally when we were out and about because I always hated the idea of carrying around a soiled (poop) diaper in my diaper bag. Soon I found that we were out an about quite a bit, especially because of my daughter’s doctor’s appointments and therapies. Which meant that he was in disposables quite often. At this point, I would say we were about 65/35 cloth to disposables. Then recently our cleaning lady put a dryer sheet in with a HUGE load of diapers because she didn’t know any better. (Cleaning lady? You just made me jealous!) You know what that does to a cloth diaper right? I almost cried. And my lazy self took like two weeks to strip them. Which meant my lazy self slipped into super lazy mode with the disposables. Honestly, disposables are easier (well, in my opinion anyway). You just chuck them in the garbage. I am aware that technically even with disposables you are supposed to dispose of the poop but let’s be honest here: no one does this. People are lazy, like me, and prefer to chuck it in the pail and go back to Facebooking playing with their children. But I want better for my kids. I don’t really want all those disgusting chemicals against my babies’ skin. I don’t want to clog up the Earth with piles of my kid’s waste that won’t decompose. I want to be responsible and well, not be lazy. And I want my kids’ bum’s to be adorable. So I am currently trying to get back to full(ish) time cloth. I think it’s important to know that even going cloth part time is AWESOME. (Absolutely! I’m so not an “all or nothing” kinda gal either. Do what you can!) You can reap so many benefits from doing cloth even just part time. You will be saving the planet from unnecessary waste, keeping unwanted chemicals away from your babies skin, reducing your child’s rick of getting diaper rashes, and saving money. I promise, you can cloth diaper EVEN if you are lazy. I’m proof of that. Just keep the disposables out of the house and you’re good. PS: I swear I didn’t pay Katie to say all of those nice things about me! Promise!